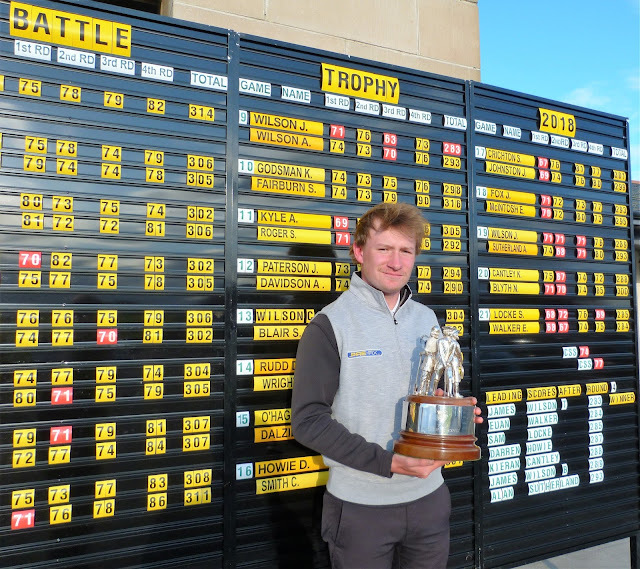 Tyneside's James Wilson, only 18 years old, came up over the Border at the weekend to win the 72-hole Battle Trophy Open over Crail Golfing Society's Craighead links. Wilson came surging up the field and into title contention with a brilliant third round of nine-under-par 63, which included an eagle and eight birdies. On paper, that equalled the course record of 63 set by Jack McDonald in 2014 but as preferrred lies were in operation on Sunday, Wilson's 63 will not officially "count." However, Wilson's great round slashed the pacemaking Euan Walker's lead from five strokes to one and the Kilmarnock Barassie man could birdie only two holes in his last 27 so he was unable to hold the charging Wilson at bay. Wilson signed off with final round of 73 for five-under-par 283 as the weather worsened but that was good enough to finish one stroke in front of Walker whose last round was a 75. Stonehaven's Scottish champion Sam Locke finished third with 69 for 285. The third round was played in very benign conditions, which allowed James Wilson the chance to go for every pin and make the most of his chances. However, the wind got steadily stronger as the day wore on until it was tearing through the course at over 20mph. In such conditions, Locke’s closing 69 was impressive and it also puts Wilson’s last-round 73 into some perspective. Commenting on his win, Wilson said: “I have entered the Lytham Trophy, so felt that I needed some competitive golf as preparation and having heard about the Battle Trophy tournament , I took a chance and travelled up from Newcastle. Euan Walker, five strokes clear of the field at halfway, was sanguine in defeat, stating that he was happy with his performance and he could not have done much more in the last round, such was the effect of the weather. Keiran Cantley was disappointed not to have ever got his challenge going properly, explaining that he could not get his putting going at all. 289 J Wilson (Balmore) 71 71 71 76. 293 A Wilson (Portmarnock) 74 73 70 76, J Fox (Portmarnock) 71 72 73 77, A J Sutherland (Cupar) 74 68 71 68. 297 J Wright (Forres) 75 70 79 73. 300 N Blyth (Germany) 71 70 74 85. 302 C Lamb (Newmachar) 80 73 75 74, J Glenn (Bishop Auckland) 70 82 77 73, C D Scott (Nairn) 74 77 70 81, S Blair (Royal Musselburgh) 71 74 82 75. 303 G Dalziel (Airdrie) 70 74 80 79.